Those of us who have the status of permanent resident and have lived without criminal legal problems for five years in United States, or three if we are married to a U.S. citizen, must seriously decide to take a step forward and become United States citizens. The federal government’s current Immigration policy must also compel us to reflect and realize that the only way in which we will not be forced to leave United States is precisely to be citizens of this country. Mexicans, as a group, takes the longest in applying for citizenship, on average more than ten years, which is nearly double what people from other countries take. D. I will cease to be Mexican or Central American. With the exception of Nicaragua, the other countries in the region, including Mexico, accept dual citizenship; so, there is no loss of citizenship. On the contrary, everything is a benefit. In the end, what I’ve found are more excuses than real arguments. The National Autonomous University of Mexico, the National Human Rights Commission, and the Carlos Slim Foundation of Mexico, have been helping people to become United States citizens, using accesolatino.org as a tool (ciudadanizate.accesolatino.org). Today I want to invite you to visit this free website; to review to see if you meet the requirements to apply; to seek guidance through local organizations such as ENLACES; to learn more about the extraordinary country of which you want to become citizens. The rights obtained through naturalization are very important. Citizenship is the best way to help your family, community and yourself. These rights go beyond voting in elections, which in and of itself is very significant, they represent what it means to live fully in this great country, the United States, which every day grows bigger and stronger with our responsible participation. 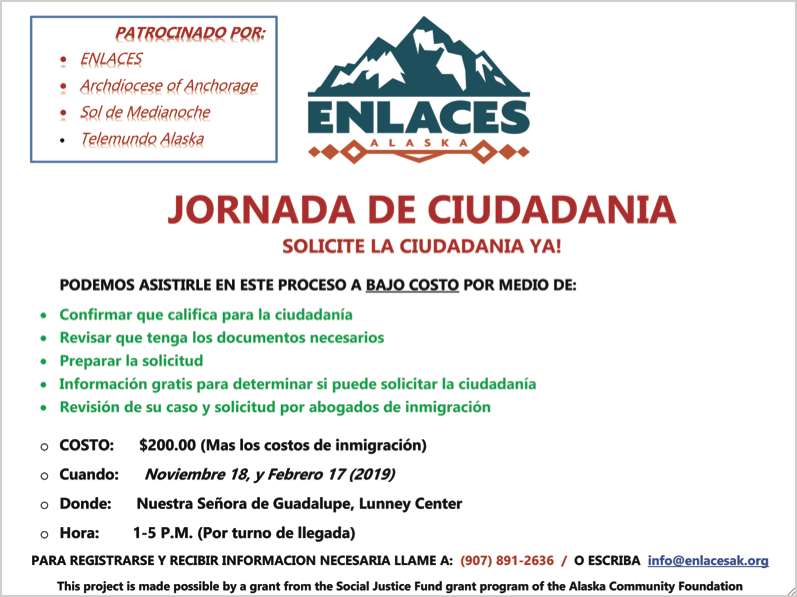 Get information at ﻿www.accesolatino.org and seek guidance at ENLACES in the city of Anchorage.